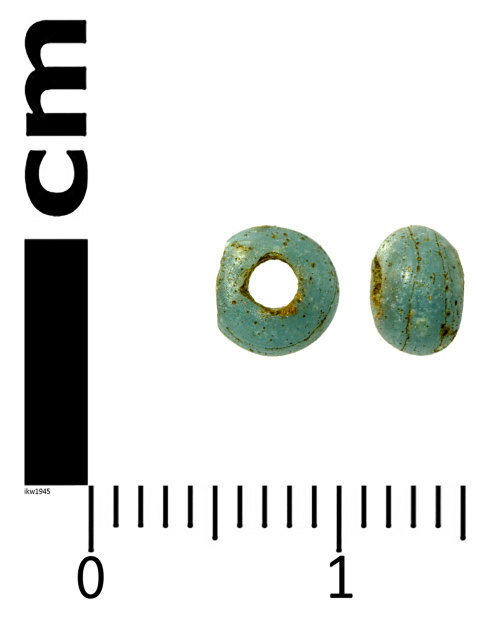 A blue glass bead of unknown date, Bronze Age to Modern, 2200 BC - AD 1950. The bead is made from opaque light blue glass with small bubbles visible in the structure. It is annular with a D shaped cross section on each side of the central hole. Spiral lines in the structure are the result of the winding process during manufacture. The bead is not decorated, and there is a large chip on one face. The bead is 4.8mm diameter, 3.3mm thick and 0.08g. The central hole is 1.8mm diameter. Blue glass was used from the Bronze Age to the 20th century and blue glass beads are often impossible to date.